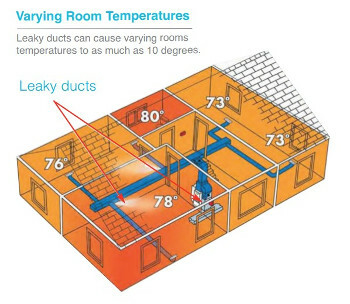 Leaky ducts can cause noticeable temperature differences throughout a home. Uninsulated ducts are a major source of energy loss for many homes. In fact, roughly 3 out of 4 homes have about 20% to 40% air leakage. This means that the air you have paid to have heated or cooled is not reaching its destination at the correct temperature, forcing your HVAC system to compensate. Luckily you can prevent this waste with Aeroseal duct sealing. In fact, many homes experience roughly 30% energy savings when they seal their ducts and reduce leakage by up to 95%. Ready to start saving money? Contact us today and schedule your free estimate in Randolph, Weymouth, Brockton, & nearby MA! What is the Aeroseal process? Green Energy Mechanical will start by plugging your registers with foam. This will force air to escape through the leaks in your ducts, making it easy for us to discover exactly where the problems are occurring. Next, we'll cut a small access hole into the supply or return and attach a temporary collar. We'll then block the AC coil, fan, and furnace to make sure no sealant particles enter these areas. A non-toxic sealant is then injected into your system to help measure exactly how much duct leakage you have. Afterward, we'll connect your system to the Aeroseal machine using flat tubing and determine the exact amount of duct leakage (On average this comes out to about 30%-40%). Aeroseal sealant is then injected into the system and exits through the leaks in your ducts. It will collect on the edge of each leak until it eventually seals it. This process can seal leaks that are up to 5/8ths of an inch and the entire process is computer controlled so that you can see the results in real time. It only takes 1 to 2 oz. of sealant material to completely seal your ducts. Finally, a computer-generated analysis will summarize the duct leakage reduction. This will let you know exactly how effective the process was. Our technician will then provide you with a printed certificate to summarize the results. Get started on Aeroseal duct sealing with a free estimate! Are you losing valuable dollars to leaky ducts? Green Energy Mechanical can help you make your home energy efficient with Aeroseal duct sealing. Contact us today and schedule your free estimate in Randolph, Weymouth, Brockton, and nearby Massachusetts!